Ajith’s first director picks Arvind Swami and Ritika Singh! The magical co-incidence between two Ritika Singh films! Fifteen minutes of Irudhi Suttru retained in Telugu Guru! Irudhi Suttru and Kaththi to meet each other on the same day? Prestigious International honour for Irudhi Suttru! A new scene in Telugu Irudhi Suttru? 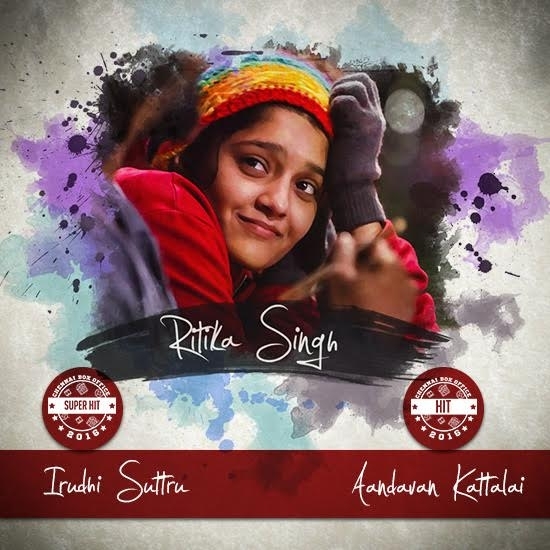 Ritika Singh - Sudha Kongara magic to kick start in Telugu! Ritika Singh and Adah Sharma begin on D-day! ''It completely killed us''- Says Ritika Singh! Be like Ritika Singh, be like Shruthi Haasan! Don't miss - Ritika's very first reaction on winning the National Award! This page hosts a weekly slideshow related to Tamil movies. Each slide includes a picture and some description about that picture. All the slides will have a recurring theme. People looking for actress stills, actress images, actor stills, actor images, movie stills, movie images, and other interesting topics, relevant issues in Tamil cinema will find this page useful. Ritika Singh | Top 10 Most Successful Tamil Actress in 2016. Enai Noki Paayum Thota release postponed!